Right at the beginning of the American Revolutionary War, the Patriots made freedom of religion one of their goals. 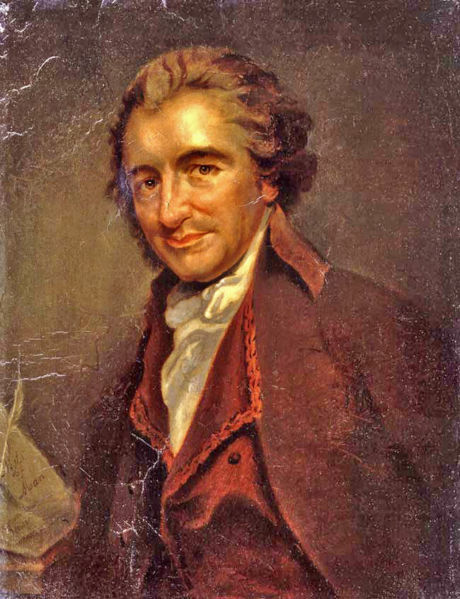 Consider this excerpt from Common Sense by Thomas Paine. Over the years some folks have made every possible effort to secularize public life. Much of this effort has focused on the public school system. And the advocates (the ACLU, for example) have justified their movement with silly semantic arguments. Thus the constitutional wall that protects religious belief from government power somehow got morphed into a separation between church and state. Look again at the first amendment. What does it say? How does First Amendment justify forcing people to abandon their religious beliefs in public square? When the public square knows no bounds, where do our public lives leave off? Where do our private lives begin? Is the education of children, for example, the private responsibly of parents or the public responsibility of government? Given the importance of teaching children the difference between right and wrong, isn’t the notion we should entirely secularize education absurd? If such a notion had been a precondition for the public school system, do you truly believe this system would now exist? Yes, in 250 years change does occurs. Unfortunately, much change is horribly ill considered, and sometimes change must be undone. Note that you may find this post relevant to our discussion. It’s kind of a silly semantic argument, but both the parenthetical definitions for “secularist” I gave above come from the Webster’s. I’m certainly not saying that all the “Founding Fathers” (a hard term to define in itself – were they the “Founders” of the Constitution?, the Bill of Rights?, the Declaration of Independence?, the state Ratifying Conventions’ attendees? or perhaps the ideological authors such as Jefferson, Adams, and Madison?) wanted to prohibit religion from all society (which would be my first paranthetical definition above), but the Constitution itself is the best evidence that the Founders did not want religion to be part of civil government (the second paranthetical definition above). Individual Founders may have had their individual opinions about the role of religion in government, but the blueprint for our government, the Constitution, quite deliberately only mentions religion twice — the First Amendment and the “No Religious Tests” Clause. In both cases, the Constitutional mention is to keep civil government out of the religion business, which is basically my second Websters definition of “secularist” quoted above. I completely agree that I don’t think that most of the Founders were anti-religious, as some have suggested (although many, such as Jefferson, Adams and Madison, were anti-clerical), but I do think that they created a Constitutional “Wall of Separation” between church and state, as Jefferson so famously wrote in hia Letter to the Danbury Babtists. I don’t really think that we disagree on the concept — just the semantics, but if you like that they created “secular state” better than “secularist state,” I think we get to the same place 250 years later. The Constitution is what it is and purposely so — a non-religious document.